Unlined breathable cotton jersey with micro dot palm. Micro dot palm helps to improve grip while knit wrist keeps out dirt and debris. This glove has a secure, comfortable fit. Gunn cut design. 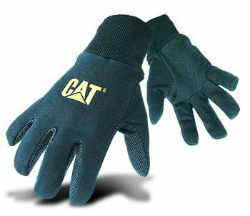 CAT® logo embroidered on back of each hand.